Observation notes: While driving along U.S. Highway 285 south just inside the New Mexico state line, we saw Gaillardia growing along the side of the road. We stopped and saw this skipper enjoying the flowers. 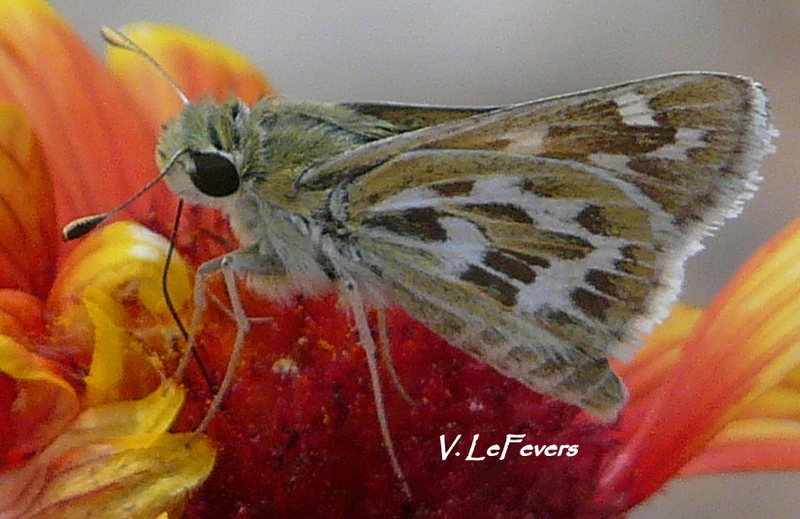 The day was partly cloudy and varied from 80-90 degrees F. I realize this is a late date for the Rhesus Skipper, so I thought I would ask the western lepidopterists make the decision on its identification. Coordinator notes: Very nice photo. This is Uncas Skipper, though Rhesus is similar. Rhesus typically flies in early summer (May-June), whereas Uncas has 2-3 generations per year and can be seen into September. Rhesus is much smaller than Uncas, but cannot judge based on a photo. Ventral hindwing of Rhesus is "boldly"marked, which is to say the three colors of white, gold and very dark brown occur in patches that are distinct and sharp-edged. Uncas has white, gold and brown (less dark) patches that are somewhat less distinct and less "bold." Nice photo!